The IEA estimates that world energy demand increased 2.3 percent year over year in 2018, nearly twice the average rate since 2010, driven by a strong global economy and increased heating and cooling needs. Natural gas, the report noted, “emerged as the fuel of choice” as it met almost half of the total increase in energy demand. Domestically, the U.S. Energy Information Administration (EIA) estimated that U.S. natural gas consumption increased by 10 percent in 2018, reaching a record high of 83.4 billion cubic feet per day (Bcf/d)– the largest increase coming from demand for natural gas in electricity generation. 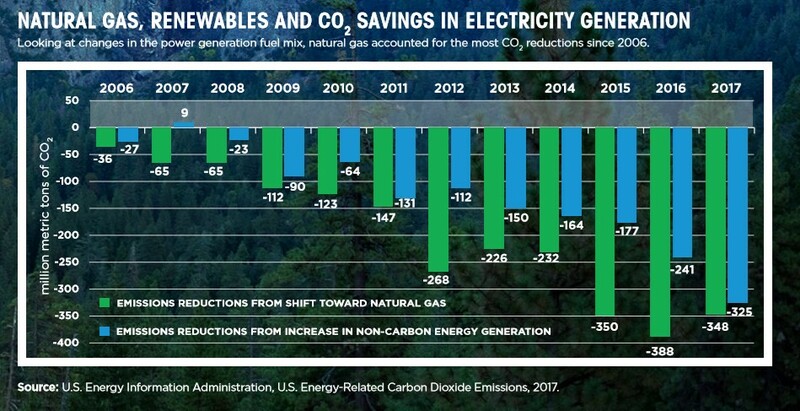 We also know that, since 2005, the EIA estimates that natural gas has been responsible for more CO2 emissions reductions in electricity generation than renewables. Now, the global numbers are in, and natural gas has once again proven it’s not going anywhere anytime soon. Reducing CO2 emissions is a big part of U.S. progress toward climate goals, and America leads the world in reducing CO2 largely because of natural gas, as well as industry’s use of advanced technologies, best practices and smart regulations. The US EIA projects that U.S. energy-related CO2 emissions will stay near their current level through 2050 – significant when you consider how much the economy likely is to grow over the next three decades. Growing natural gas use has been the chief factor in decoupling economic growth and rising emissions. Globally, U.S. natural gas can play an important role in reducing emissions. Increased U.S. exports of liquefied natural gas (LNG) can allow other nations to replicate what has been achieved here. These exports have skyrocketed thanks to increased domestic production, reaching nearly 1.1 trillion cubic feet last year. Again, we’ve seen how natural gas has helped drive down U.S. CO2 emissions – now, imagine the emissions reduction benefit with more and more U.S. natural gas supplying markets around the world. The benefits of natural gas’ expanded role in the global energy mix continue to become clear. As the U.S. and our allies abroad work toward work toward emissions-reduction and climate goals, while providing the affordable and reliable energy our modern societies depend on, natural gas remains the fuel of choice.